Sionfonds supports Haitian artisans. We help in manufacturing and selling beautiful handmade arts and crafts in order to promote education and employment opportunities which create self reliance and empowerment. Our sewing school is partnering with Peacequilts to create sewing collectives that design and make out standing works of art that “can change a life ” as our field director Mirlene Desirale said when visited their collective outside of Port au Prince last November. Visit the sewing school page to learn more about this exciting new project. Nishtone Degazon is our resident artist, we have many of his beautiful works of art for sale here. Nisthone Degazon is an artist with social mission. He grew up in Port-au-Prince with his mother, three brothers and three sisters. His father was a doctor in a small town far from Port-au-Prince and only came home once a month. Two of Degazon’s older brothers were artists, and Degazon did not intend to follow in their footsteps. But under their influence, he began to draw and found that he had both aptitude and a passion for the arts. After completing a regular academic high school, he did a two year apprenticeship at a craft center. Following that he completed a four-year degree at the National School of the Arts. Degazon’s original specialty was banana leaf art in which dried leaves are meticulously cut out to form patterns and pictures. While he was also trained in wood work, he saw the damage deforestation was causing to the country. Banana leaves, on the other hand, are a wasted byproduct of banana crops. Using them in art creates a secondary product which enables families to earn more money. In college, Degazon was introduced to painting. He initially specialized in portraits but found that they were not commercially viable. 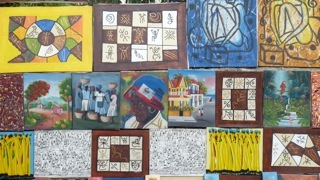 He now paints both the primitive style that characterizes much of Haitian painting and his favorite style, abstract. Degazon’s second love is teaching. With his studio in his home, Degazon found that some youth in the neighborhood took an interest in his art and wanted to learn themselves. Prior to the earthquake he was training fifteen youth to make banana leaf art and simple leather bracelets. He paid them a fair wage for their work. Unfortunately his house was destroyed in the earthquake, and he had to move to a much smaller house where he now has only four young men working with him. 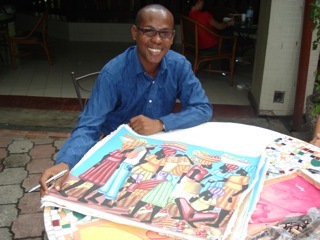 He says he would like to find some girls but has had a hard time as much Haitian art is dominated by men. Degazon is a member of the Church of Latter Day Saints, is married and has an eleven year old son. His goal is to set up a large studio and gallery where he can work and train young people in metal work, painting and other styles of Haitian art.